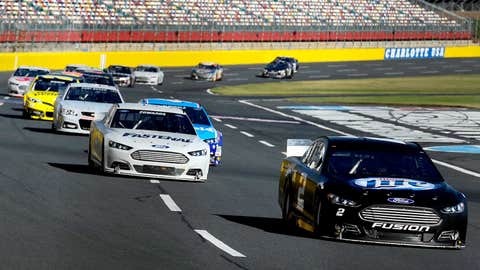 Brad Keselowski (2) leads a pack of cars during testing at Charlotte Motor Speedway on Dec. 11. After NASCAR released their 2014 competition package, I picked up the phone and called a crew chief buddy of mine. We spent quite a long time on the phone and he gave me his thoughts on this. When you look at this, you really have a two-part deal. You have the aero changes and the ride-height deal. For an outsider looking in on the ride-height deal, it still opens open a can of worms as far as the car getting in and out of the garage area. Is it going to affect getting the jack under the car for pit stops, etc.? There are a lot of things that are still untapped territory with this essentially no ride height rule. It’s what we call the law of unintended consequences. We probably won’t know some of these things until we encounter them. What I do like about it, what I do applaud and what I think is going to be a big relief throughout the garage area is no longer in post-race will a crew chief, engineer, car chief, driver, owner, etc. be on pins and needles worrying about if their car is going to be 1/8 of an inch too low. That would have cost you points, probation, money, etc. for being 1/8 of an inch too low after a 500-mile race. I realize it’s going to be a lot of work for these teams. It really isn’t as simple as saying we can run the car as low as we want to now. There are a lot of parts and pieces to make that work. There is a lot of money spent on springs, for example, to make them work the way they want them to. Long-term, however, the teams are going to really like not having to flirt with potential penalties after a long race for simply being too low. This is going to make for a totally different spring package. While you won’t have to throw all your notes out you collected on this Gen-6 car, obviously, you still will be back to square one. The aero changes alone will take a bunch of pages out of the notebook that were accumulated this past season. The aero changes that were announced collectively will increase the downforce of these cars. I am talking about more downforce on the front and rear of the car. Just more total overall downforce which is going to produce more grip on the racetrack, which in turn is going to create faster speeds in the corners. There is no question that this one has me scratching my head. This one has me saying to myself, "Is this really what we needed to do?" The answer, plain and simple, is I don’t know. No way am I going to challenge NASCAR because they have spent countless hours and countless dollars trying to come up with a way to make our racing better. The reason I applaud that is it would have been really easy for NASCAR to simply not do a thing during the offseason. The Gen-6 car exceeded everyone’s expectations. We had 17 different winners in 36 events. You fall back to the old cliché of, "if it ain’t broke — don’t fix it." I would have, and I know from talking to a lot of guys in the garage, they would have liked to have gotten to run this car another year to see how it all played out. In the same breath, however, you have to applaud NASCAR for not simply sticking their head in the sand, and making a commitment to try making the racing better. The reality is we simply won’t know until we go run a race. Sure, you can test all you want. You can test until the cows come home, but until you put 43 cars out there under race conditions, then we really, truly won’t know what we have. 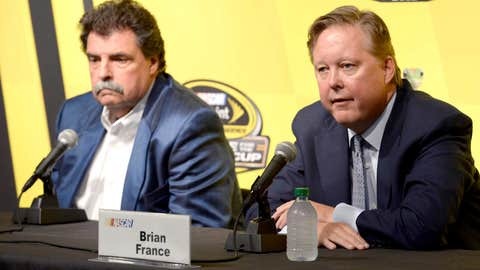 NASCAR president Mike Helton (left) and NASCAR chairman Brian France (right) undoubtedly had a hand in the new rules package for 2014. Also, remember that some of these answers won’t become clearer until the second race of the year which is at Las Vegas, a mile-and-a-half track. The races at Daytona and the races at Talladega have their own special rules packages separate from the other tracks. I would wager we won’t get full answers until approximately the fifth race of the year which is the two-mile track at Auto Club Speedway in California. 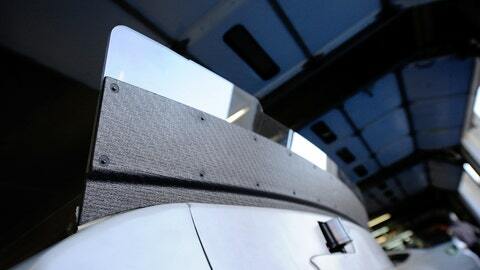 Some of the changes will allow the evacuation of air out from under the car. Anytime you can do that, well, once again, you create down force. The other thing they are hoping they accomplish with this, which honestly I am excited to see if it works, is that the driveability of a car behind another car is not affected as much as it was under the old configuration. As we all know, for every action there is a reaction. Someone that is also going to have to react is Goodyear. They definitely are going to have to put their work clothes on. When you put more downforce in these cars and make the corner speeds faster, well, naturally it is going to affect the race tire that they bring to the various tracks. So the bottom line is the teams know they have the same package at the Daytona 500 this coming February as they had back in Talladega in October. So that’s good news for them. We simply won’t know how these new changes will affect things until we get a handful of races under our belts at tracks that are non-restrictor plate tracks. I will say I know in talking to a lot of drivers, this is definitely different than what they were asking NASCAR to do. Greg Biffle, for one, was lobbying for less downforce. So was his teammate, Carl Edwards. So there is a lot more unknowns as we head into the 2014 season. Believe it or not, it’s just around the corner and I, for one, can’t wait.